Halak, Miklos leads with 4/4. Unrated Alkire, Brian(USA) doing well with 3/4. 33 players taking part in another installment of this Grand Prix. 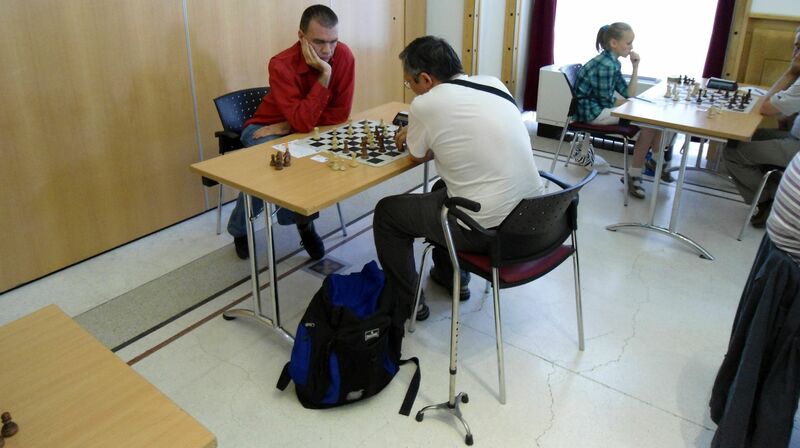 The Budapest Open was not enough for some players. IM Szabolcsi was clear first with 7/9. Well done! Other strong performances of note. I did ok with 6/9 but I was quite lucky to win a couple of totally lost positions. IM Fernandez, Daniel(SIN) was clear first with 6.5/9. FM Juhasz, Kristof(HUN) was clear first with 6.5/9. Juhasz Armin also did well with 5/9. I managed to win after making a big effort against Karacsonyi, Kata(age 8) who defended with a Semi-Slav. 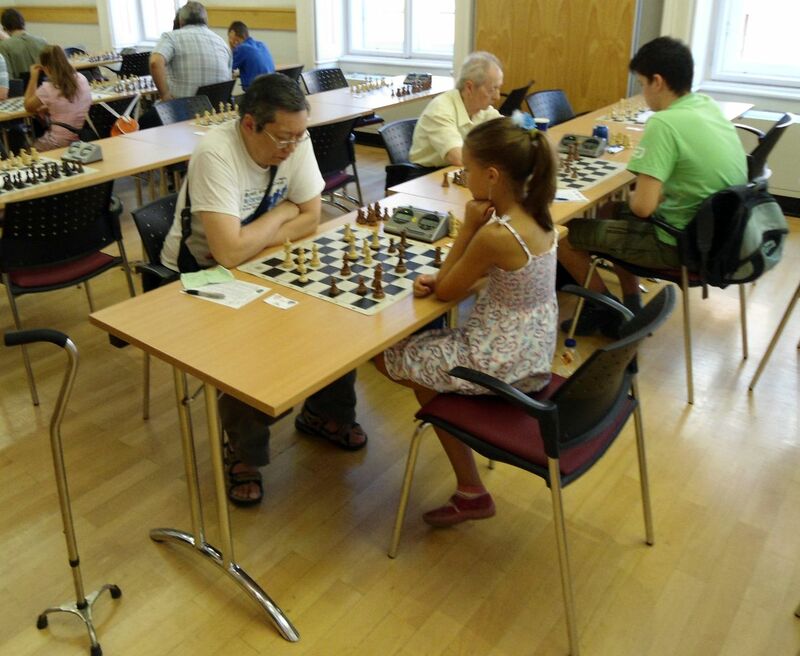 Kata is one of the promising youngsters of Hungarian chess. Thanks to Heyl,Thomas(GER) for the picture. I lost a tough game in rd2 when I got too clever in the opening and made a large number of inaccurate moves. Thanks to Heyl(GER) for the pictures. On move 8 I came up with the original 8..Ke7!? (diagram) to unpin Nc6. 13.g4(diagram) and Rubinstein played 13..Ke7! and went on to win. Another loss for the ladies. Gara,Anita got the day off. Madl played 37.Kb1 and lost. However, 37.c4! won as Black’s queen cannot guard g6. for example 37..Qh5 38.Rxf7! (diagram) Black ends up dropping a couple of pawns. White wins the weak e4 pawn with 41.Re2 and the two extra pawns give an easy win. Hungary finished in a massive tie for second. The ladies are having a tough time and lost again today. However, Madl won and is having a great tournament with 6/9 so far. The men are on a roll and won again. On Board 2 Balogh continued his fine play and won with black against Parligras. Balogh has 6.5/8 (for a TPR of 2856!) and is having a fabulous tournament. After 30Rxc6(diagram) material is even in a rook ending but on 30..d3! Black dominated and eventually won. Hungary is in clear second! Russia leads with a perfect score, followed by China in clear 2nd. After 20..f6? (diagram) Rapport played 21.Bxe5 to win a piece(22.Qc4+ forks off Bg4) so 1-0.